In 2004, Peter Underdog released the CD in one era...and out the other which had limited distribution, poor airplay (maybe one spin on Valley Free Radio), and was finally recalled by the distributor because the cheap ink-jet printed labels were known to gum up CD players (in the unlikely event that someone dared to listen to it). Not exactly a little hug for the Bushie. Peter Underdog, who makes no attempts to hide the fact that he is a member of the Democrat party, says that original track from in one era... will be remixed and re-released "real soon now". In the meantime, he has 'trumpdated' this old tune with new lyrics about you-know-who. This release is designated Superegomaniac 2.0 as it is a major update of the original. Any incremental updates will be designated with minor decimal version numbers, 2.1, 2.2, etc. Now is a good time to release 2.0, since this could all be old news in a couple of weeks. 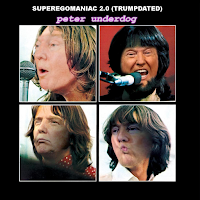 "Hey Donald, Peter Underdog wrote a song about you." Donald: "I don't know Peter Underdog. I never met Peter Underdog. Who is Peter Underdog?"